Charlotte Amalie, ST. THOMAS(December 17th 2015):- — Another shooting incident has resulted in a victim being treated for a gunshot wound at the Roy Lester Schneider Regional Medical Center, bringing the total amount of shooting victims in the territory to four days to two dozens. Between Monday and Tuesday, five people were shot on St. Croix. Last Sunday night, a man was gunned down, his body riddled with bullets, in St. Thomas. 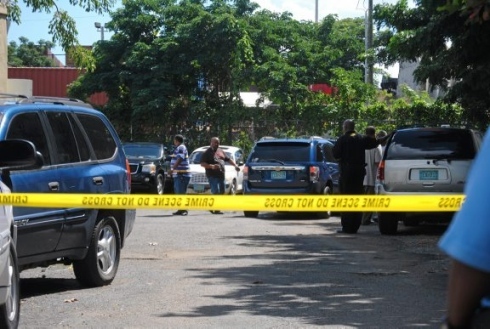 And last Friday, five men were shot on St. Croix — a total of eleven shooting victims in four days, with this latest incident carrying the tally to 12. According to a police report issued by VIPD Media Specialist Sakeeda Freeman today, on Tuesday at about 7:30 p.m., officers responded to a report of a gunshot victim seeking treatment at the hospital. Officers met with the victim at the medical facility, who’d sustained a single gunshot wound to the right thigh. The victim said he was hanging out in the area of Lake’s Fry Chicken located in Smith bay, when he heard gunshots being fired. The victim stated that he immediately got up and ran until he stopped and noticed blood running down his leg. The wounded man told police that he was unable to provide a description of the suspect who shot him, and detectives with the Criminal Investigation Bureau are following the matter closely, according to the release.